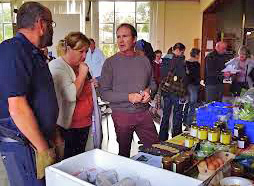 Started in 2005 with just a handful of stallholders and attendees, the biennial Black Isle Gathering has grown in popularity and last time saw over 80 stalls visited by over 800 people. If you are based in the Black Isle and run any kind of group, club, voluntary organisation or small business why not come along? It is free to attend and free to participate. Network, shop, see old friends and customers, make new ones. Great food, great entertainment, and a great Black Isle blether!